Welcome to Part 2 of my Halloween Costume Series, My Pretty Pumpkins! If Last weeks Look wasnt for you - Then Check out this Gruesome Gatsby Look <3 I recently Got around to Watching the Great Gatsby and was so inspired by the glamour and style of the era - so I decided to incorporate it into my next Halloween look! 1. As always, Start with a clean, dry skin and then apply your foundation! I am Using MUA Undress your Skin Foundation in Porcelain - I wanted to choose a very fair shade to give a washed out, pale look to the Skin! I then set my foundation by buffing on MUA Matte Perfect Translucent Powder with my Kabuki Brush. 2. 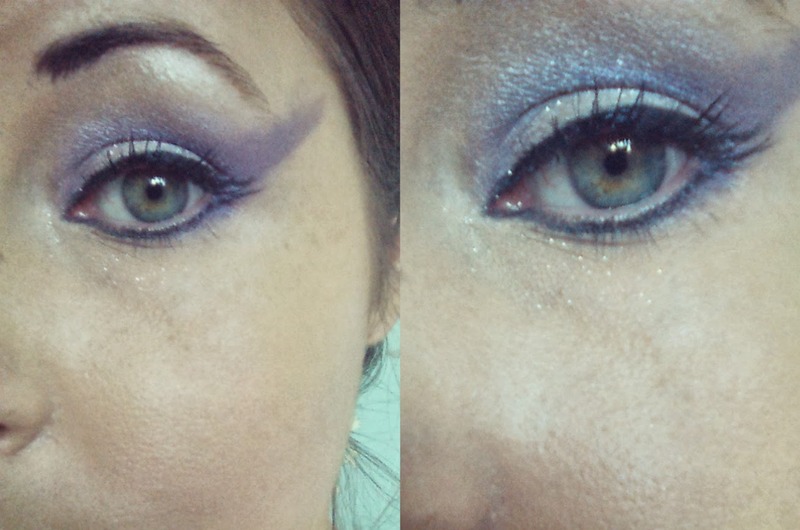 Now its time to create the eye look. 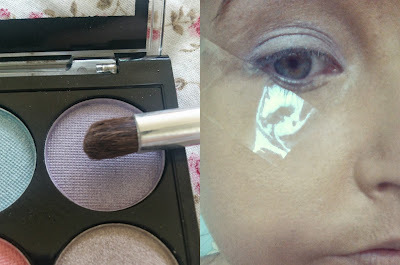 I am starting by applying this fair shade of Eyeshadow from the MUA Undress me too palette all over my eyelid and right up under my brow bone. I am using my small Fluffy Brush from E.L.F to do this. 3. 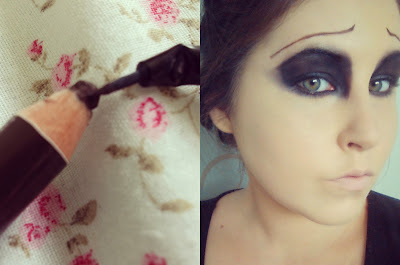 Next I am using the Black eyeshadow from the same palette to fill in my entire eyelid and, again, up to the brow bone. I also filled in my eyebrow as we are going to draw some new ones on in the next step. I have blended this out with my MUA angled shadow brush as I do not want it to appear perfect and precise. I also Dusted my lower lash line with the same shade and dragged it out to a small V shape in the inner corner of my eye. 4. Now its time to add in the eyebrows. I wanted them to be very thin, to reflect the style at the time, so I am using my ELF Bent eyeliner brush to draw them on, and I am using the MUA eyebrow Pencil in Brunette. 5. 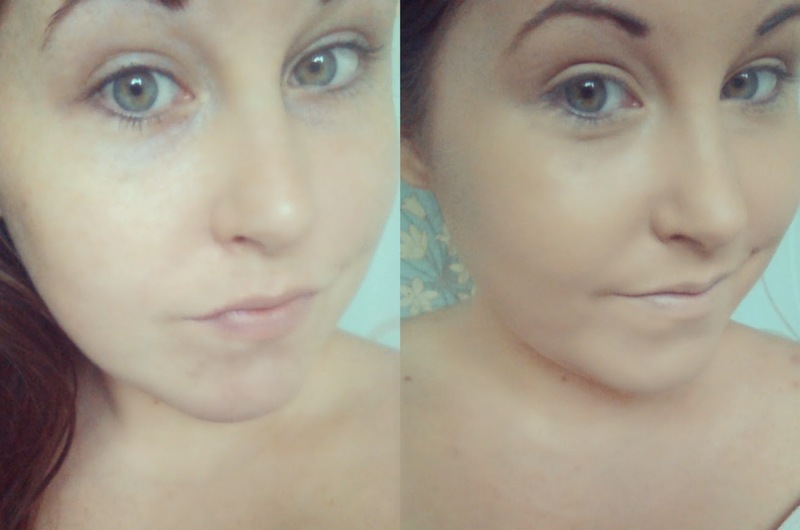 Next I created a little depth to the face by applying this MUA Blusher in shade 6 with my MUA bronzer and Blusher Brush. I Picked up a little blusher at a time on the brush and dusted the underside of my cheek bones to give a hollow impression. I built up the colour a little at a time until it looked like the picture above - but you can add more if your feeling brave! 6. Now its time to get Lippy!! I always start by lining my lips with pencil as it gives your Lipstick something to grip to - preventing rub offs! 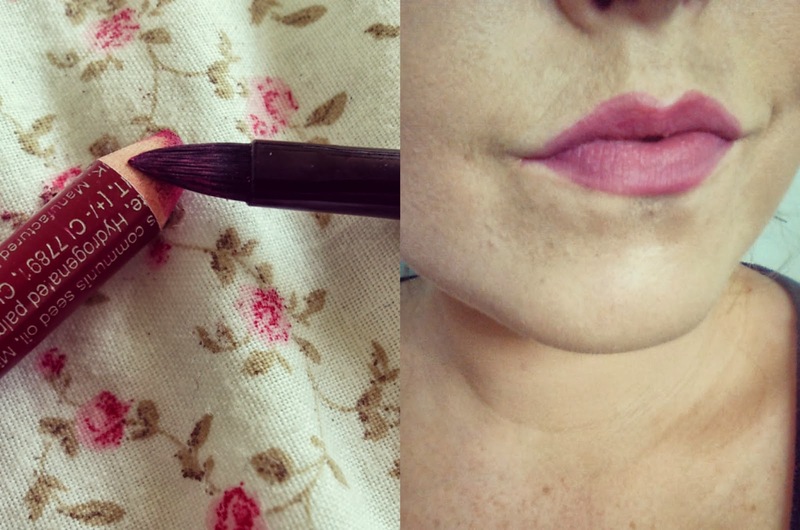 I am Using MUA lip Pencil in 'Drama' & My MUA Lip Brush. 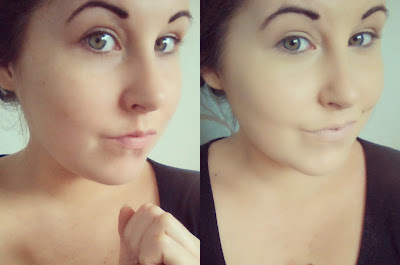 I have created an exaggerated cupids bow on my top lip to make my lips pop more! 7. I finished off the lips by mixing some of this Fashionista Lipstick in shade 'Style Transformation' With some Black Miss Sporty Lipstick I have - You could use any plum or red shade though, They will all look very glamorous with the dark eyes. 8. I have applied a pair of My Kissed Lashes in the 'Natural One', because even though this is a dark look, The 30's & 40's were a very glamorous time, and I want to reflect that. 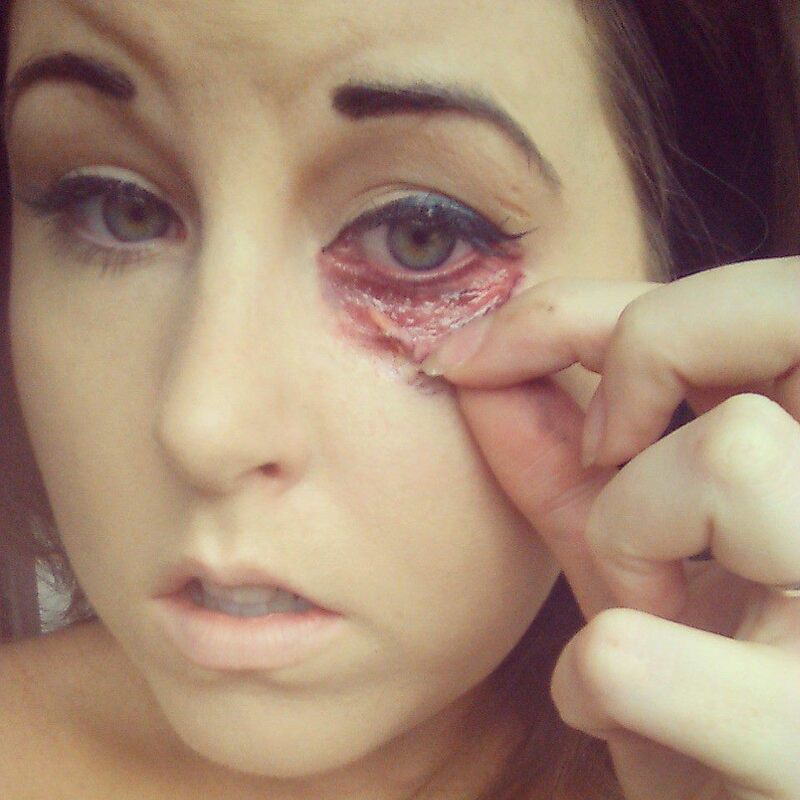 If you do decide to try out liquid latex then, using a small paintbrush, paint a circle of it onto one side of your forehead - Trying to avoid your hair line. Let the Latex dry & make a small gap in it with the other end of your paintbrush - this is where the fake blood will go! It will looks something like my pictures above! 10. To create the look of The Blood I am using Snazaroo 'special FX cake blood' as the colour is very realistic and you can mix it to any consistency you require. I started by filling in the gap I made in the latex with a small paintbrush and also painting underneath the latex (you can see in the second image) to give dimension and depth. I then made the cake blood quite watery and pressed the paintbrush firmly against my skin, this made the blood drip down my forehead a little - which really adds to the effect! I also used the Black eyeshadow from the MUA Undress me too palette to blend around the latex to give a briused effect - try to wait until the cake blood has dried a little to do this and it will blend in with the eyeshadow perfectly. You can keep blending until you are happy with your effect! 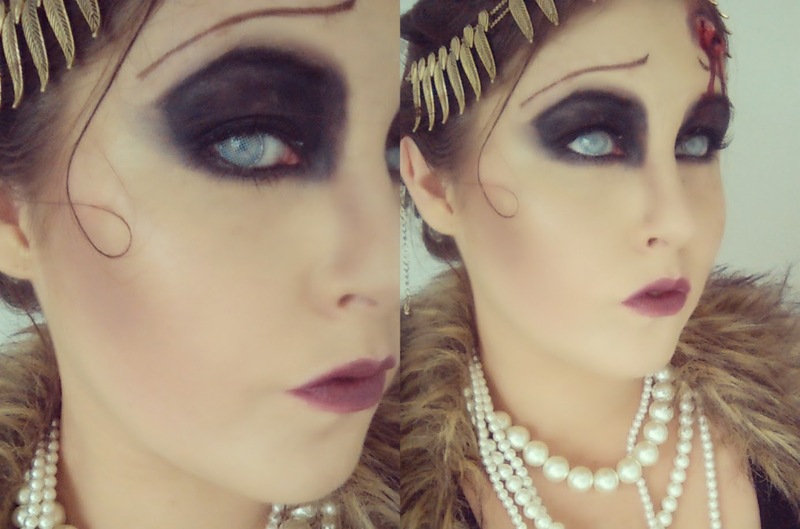 I Bought these lenses from my local costume store for £15 - they are 'white mesh lenses' and give a white out effect over the entire eye. I spotted these and just had to have them - they give a beautiful ghostly feel to the look which is just perfect! 12. && now the finishing touches! I bought this beautiful necklace from Primark for just £4 & I thought it would look perfect as a Gatsby style head dress - I simply attached it to my hair with some bobby pins|! I picked up this Lovely Fur collar from Ebay for a bargain £4.99 - it sits just around the shoulders and is very Gatsby Glam! I also found this Lovely layered pearl necklace in the Miss Selfdridge sale - Pearls are a statement piece from the Gastby era and you could use any pearls you have at home for this! 13. The last thing I did to the look after pinning back my hair and attaching the headdress (necklace!) was to pull out a small strand of hair and hair spray it in a small curl against my skin. If you hold the section of hair and spray it and then gently press it to your skin in the shape you like then it wont make your lovely make up run! && there you have it! You have now been cascaded into the glam era and will sure to be the main attraction at any halloween event! I Love this look as it is so easy and can be done by any ability of make up artist, wether beginner or seasoned! You can tone it down or gore it up until your hearts content! I hope you found this Look Inspiring - Let me see your Pictures!! I have been so excited to write this post! I recently came into contact with the Lovely 'Prairie Charms' & got involved with their Project Blogger! Every Blogger is invited to join & the winner will get to design their own hair or jewelry piece (eek! ), as well as being lucky enough to get their hands on a 25% off code for all their lovely readers - how exciting! You can read some more about it here . Prairie Charms are a boutique which make all orders and items by hand - something which really excited me, as it is very rare to come across such companies! When my order came (very fast, I might add!) 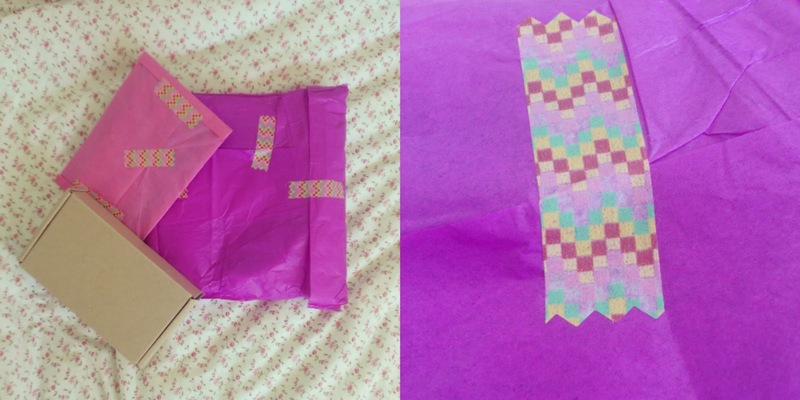 It was all wrapped up with cutest paper & tape .. I'm a packaging fanatic so this only made me more giddy! 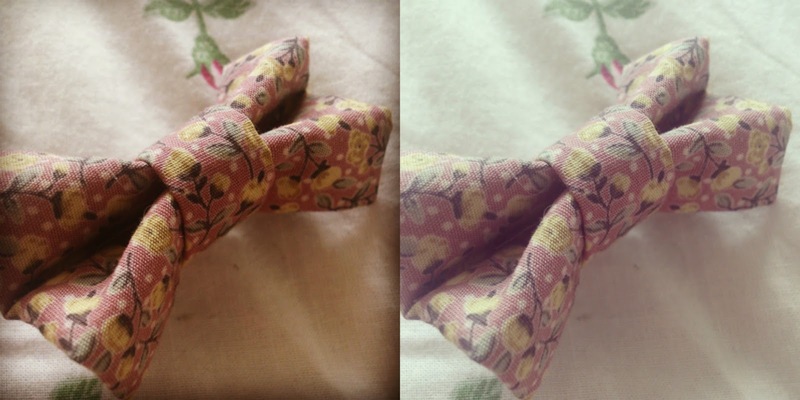 The first item I chose was The Aaliyah Bow ($10, £6.50) - so cute! 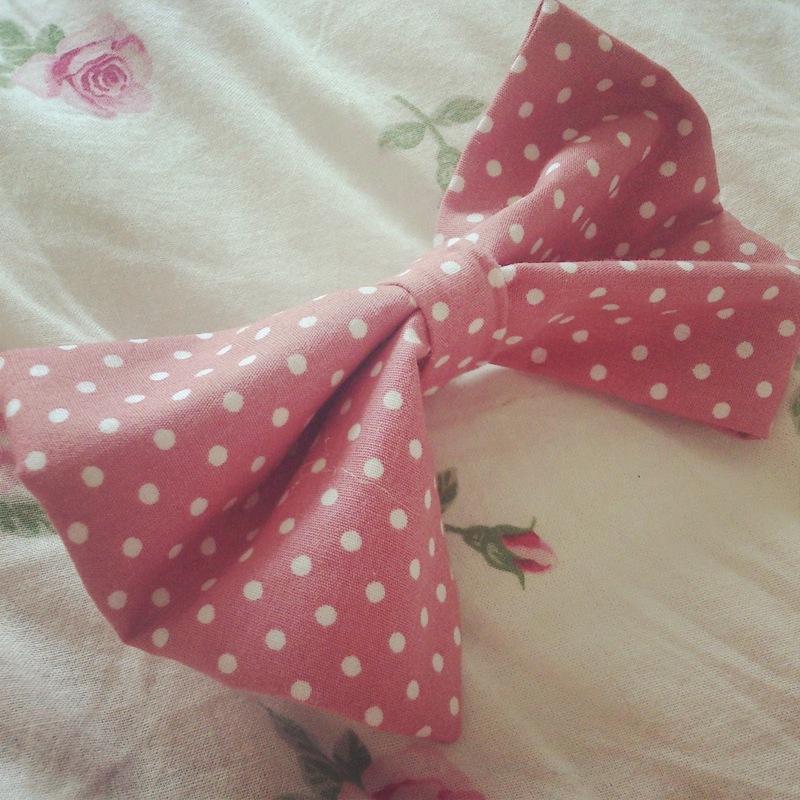 The bow is a Beautiful Dusty rose colour with an ultra girly polka dot pattern! It is made from very robust fabric & attached to a lovely crocodile clip - so it is very easy to grip in! 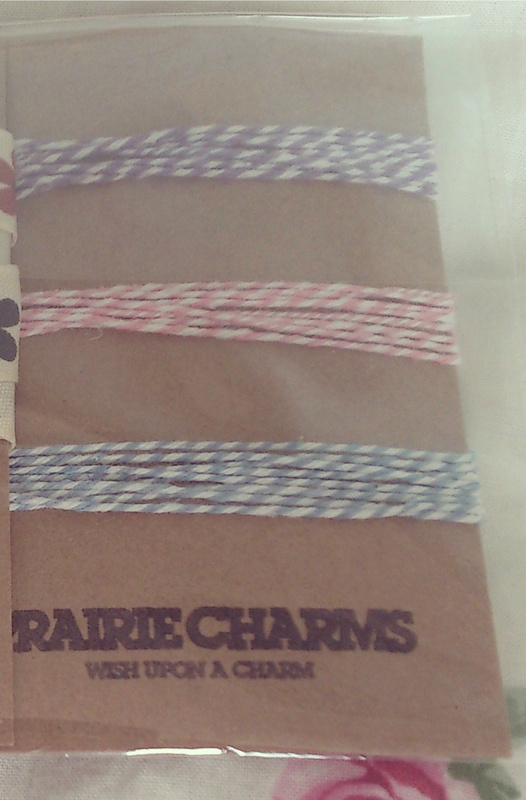 The next item I chose was the Vivienne Knot Ties ($7.50,£5) in a set of 3! These come in a rainbow of colours but I settled on the orange ones! The colour is so bold & cheerful - I love it! I have never had an accessory in this colour & I'm so pleased I decided on it as they will be perfect on my Holiday! 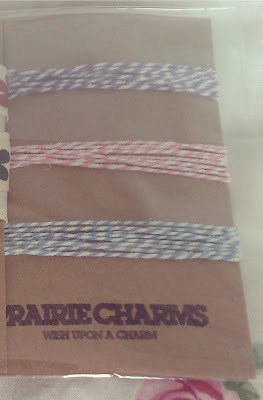 The Printed Prairie Charms Card which the Knots come on is so adorable and rustic! The Knots are very versatile & can be worn in a variety of ways, I wore them on my wrist (you can stack them for ultimate fun) & tied my hair with them too! They're so cute & didn't snap my hair like some hair bands do! 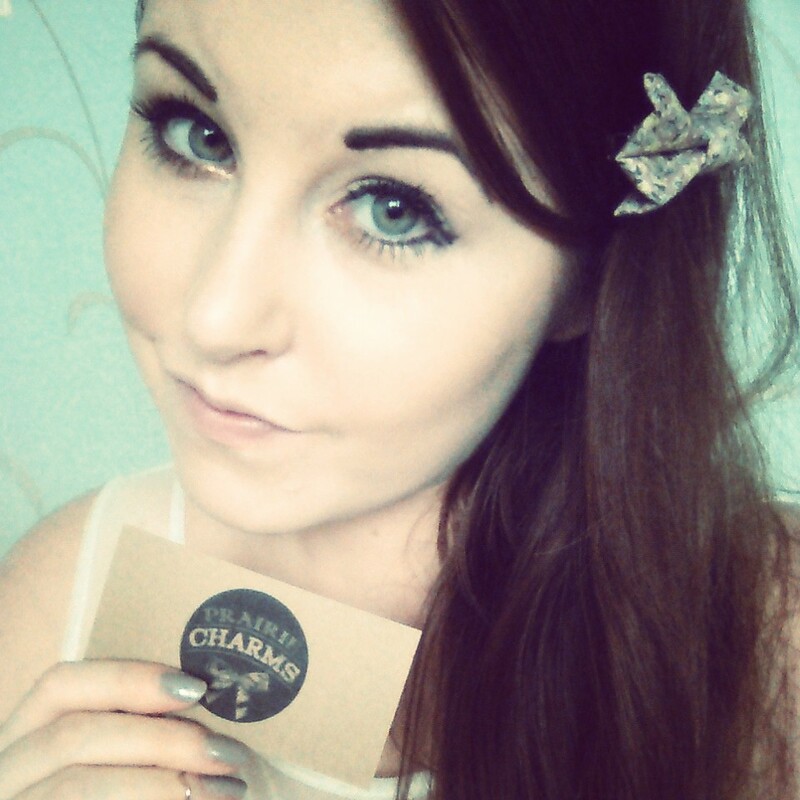 I was so Lucky & got sent this sweet little bow too! 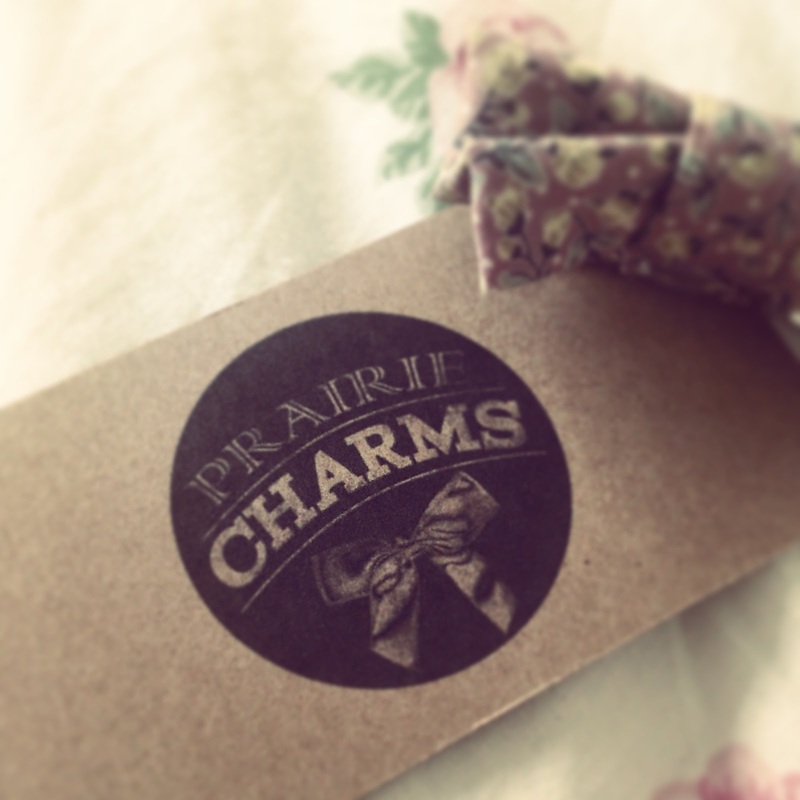 (Thankyou Prairie Charms! <3) I'm not too sure what it is called but if you like little bows then you wont be disappointed, there are plenty of pretties to choose from when you visit the boutique! The robust fabric of this bow reminds me of a beautiful tapestry & I love the yellow floral pattern against the dusty pink background! 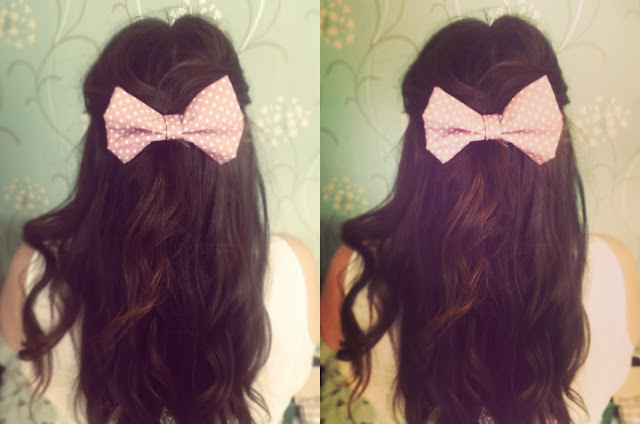 This bow also features a crocodile clip so it is easy to include in any hair do you create! I clipped it onto my dress too - it made an adorable little detachable applique! I also Decided to try out the Bessie Gift Thread ($2.30,£1.50) as the pastels really caught my eye - I'm a sucker for pastels. This Thread is so cute and would look wonderful adorning any gift, its got a lovely twirly pattern and comes in a set of 3 pretty colours! I decided to use the Threads to wrap my hair instead of a gift - it was so much fun! As I braided my hair I pulled the threads through (I used all 3 as I couldn't decide which was my favourite!) & then once I reached bottom of the braid I wrapped them back up it diagonally! 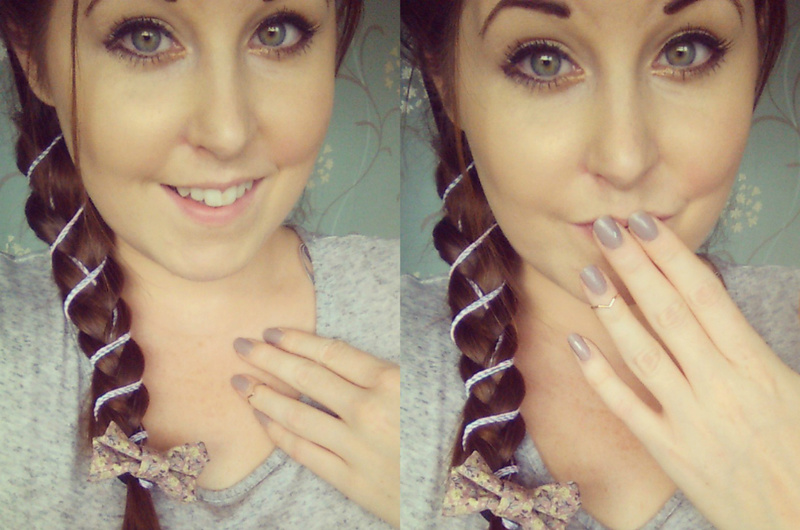 I finished off my braid with the cute petite bow! I am so impressed with this piece, considering it is handmade, it is so neat and perfect! The Crown is made up from beautiful, realistic looking roses & leaves attached to a strong (but comfortable!) headband! 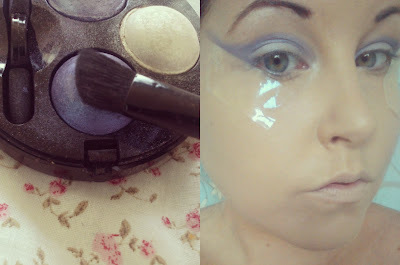 I have also used the crown as the finishing touch to my Enchanted look (full instructions on the look here). I was looking for something which my look was missing and this was the perfect thing as it is so girly and fairytale like! 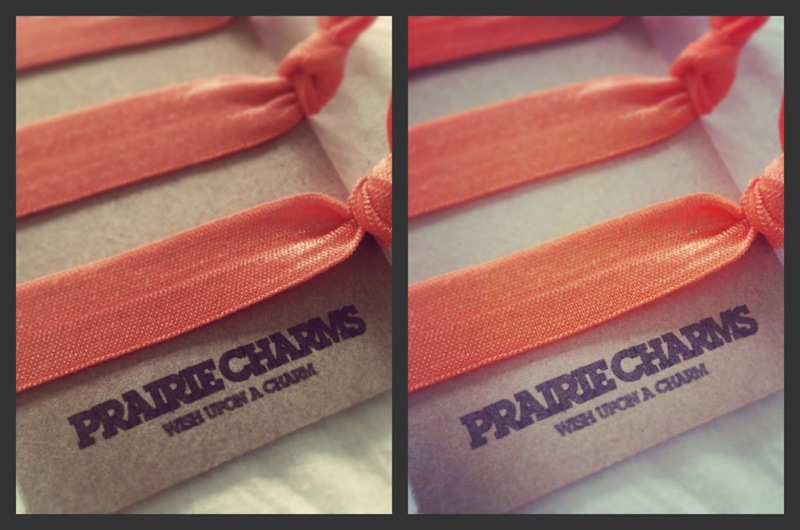 Thankyou Prairie Charms & I Look forward to seeing what you create next! 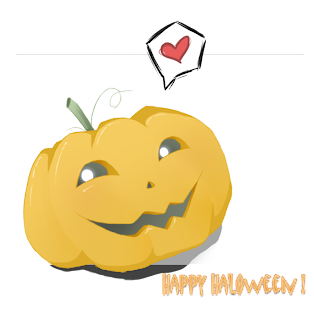 Welcome, Pretty Pumpkins, to the first installment of my 'Halloween Costume Series' - I hope you are as excited as I am! The Look this week is Called 'Enchanted' Its fun, girly & very versatile - you can take this base look and transform it into anything you can think of - fairies, unicorns, dollies - anything! 1. Make sure you have a clean, fresh skin to start with, and then apply your foundation and some translucent powder, this will give you a beautiful matte look and will also help your make-up stay in place all night long! I have used a mix of MUA Matte Perfect Foundation & Undress your skin foundation and then MUA Matte Perfect Translucent powder to set! 2. Now you need to take some sellotape (dont freak out!) and place it gently against your skin, you need to make sure it is diagonal against your eye, try placing one end at your temple and the other pointing down toward the tip of your nose. Doing this will ensure you get a clean, precise application when you come to apply your eyeshadow! 4. The next step is to choose your colour theme (I am using purples!) and then chose a light shade of this colour! I am using the pastel purple in the MUA Pretty Pastels Palette. Using the same small round brush Apply this all over the lid and blend very slightly upward from the outer corner of your eye to create a 'V' shape. 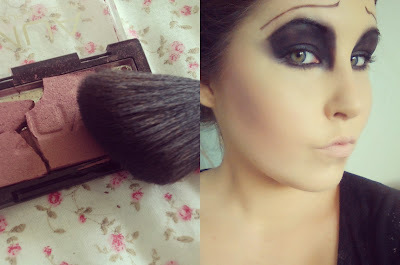 If you are unfamiliar with using eyeshadow just do a little at a time - building the colour up! 5. Now you need to chose a slightly darker shade of your chosen colour! 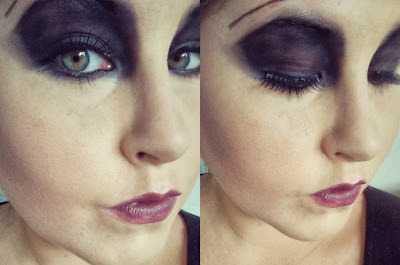 I am using this dark shade from the Passion eyeshadow Trio by MUA. Using an angled brush (like this one I have from MUA) apply this shade across the crease of your eye socket and then blend up toward your temple - you will get a lovely straight flick & you can blend it into the crease to give pretty shape! 6. Next its time to apply some eyeliner! Eyeliner gives fantastic shape & definition to the eye & you can create all sorts of patterns and designs! 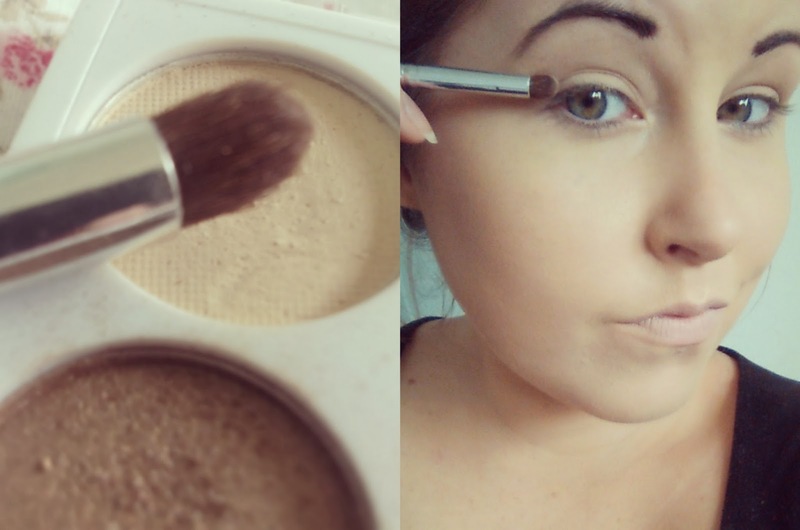 I am using this amazing angled liner brush by ELF (Review all about it coming soon!). The shape of this brush means you can be very steady & precise with your eyeliner application so it is great for beginners! 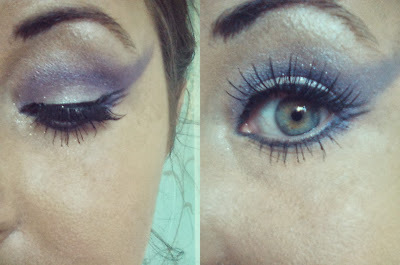 I am using Gel eyeliner for this look & I have chosen this one by 'Fashionista'! 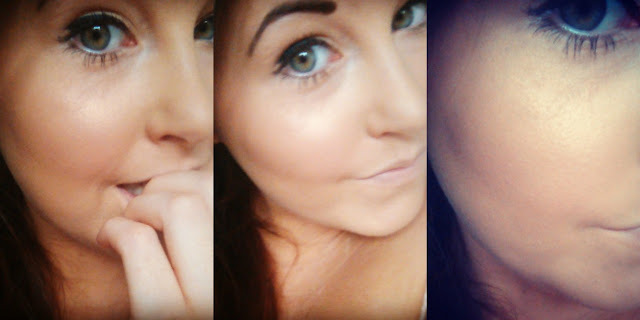 This Gel liner is creamy & very pigmented so you don't have to apply hundreds of layers! 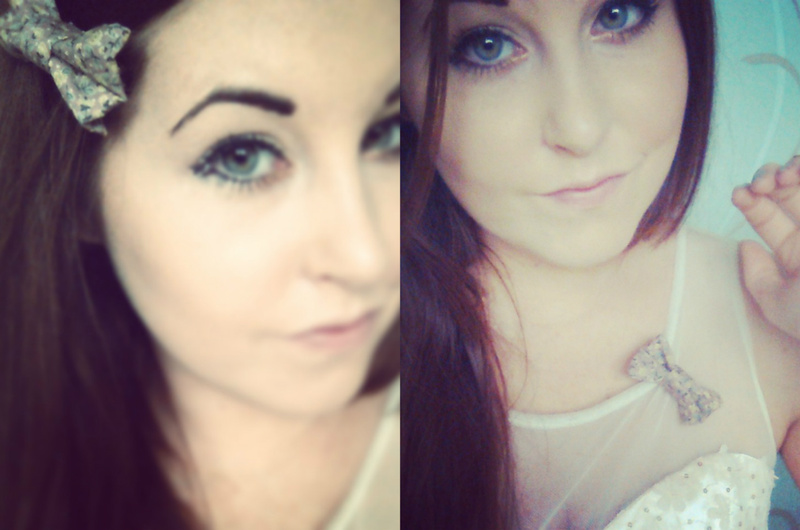 I applied my liner in a double winged style! I made a thicker line on my eyelid & softly lined my lower lashline - flicking both ends out to give my eyes a larger appearance! 7. Next I carefully applied some white glitter to my eyelid! 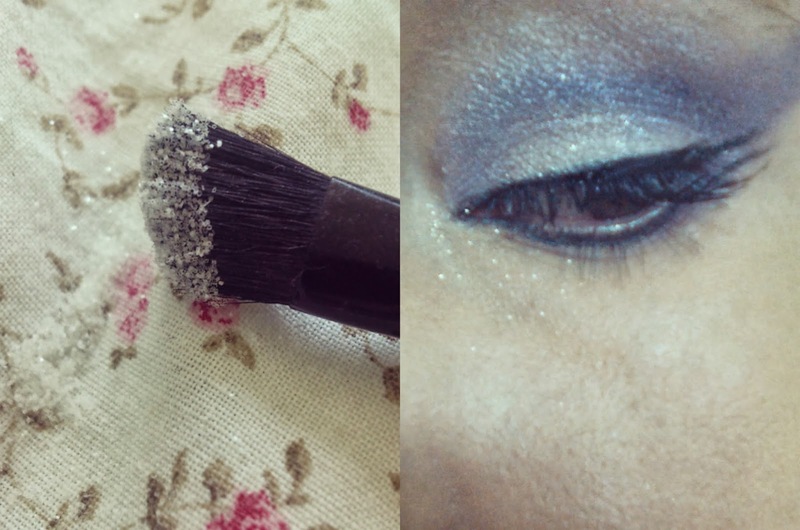 Glitter can be tricky so make sure you just apply a little at a time until you have the look you want! I extended the glitter out to just next to my tear duct, and a little under the eye! 8. Now its time for some drama! I added some of my Kissed Lashes in 'The natural one' to give a pretty, girly finish to the eyes! I also used some of my MUA lash boom on my bottom lashes! 9. Here is where the fun begins! I started by gently dusting my temples with the light pastel shade of eyeshadow and then I applied some Gems & Pearls which I found on eBay! 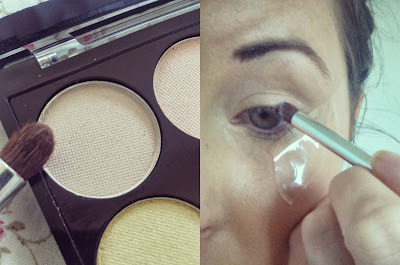 I applied these with eyelash glue - as it is safe for your skin and can be easily removed! You can apply these as randomly as you like - get creative! 10. I have also made my look a little more 'fantasy' by wiggling some of this gorgeous 'colourful lashes' mascara by H&M on the ends of my lashes! Its so cute - dont you think?! 11. I thought it was important to have a flushed cheek look to add to the girli-ness so I decided to try out my new HD blush by ELF (review also coming soon!) 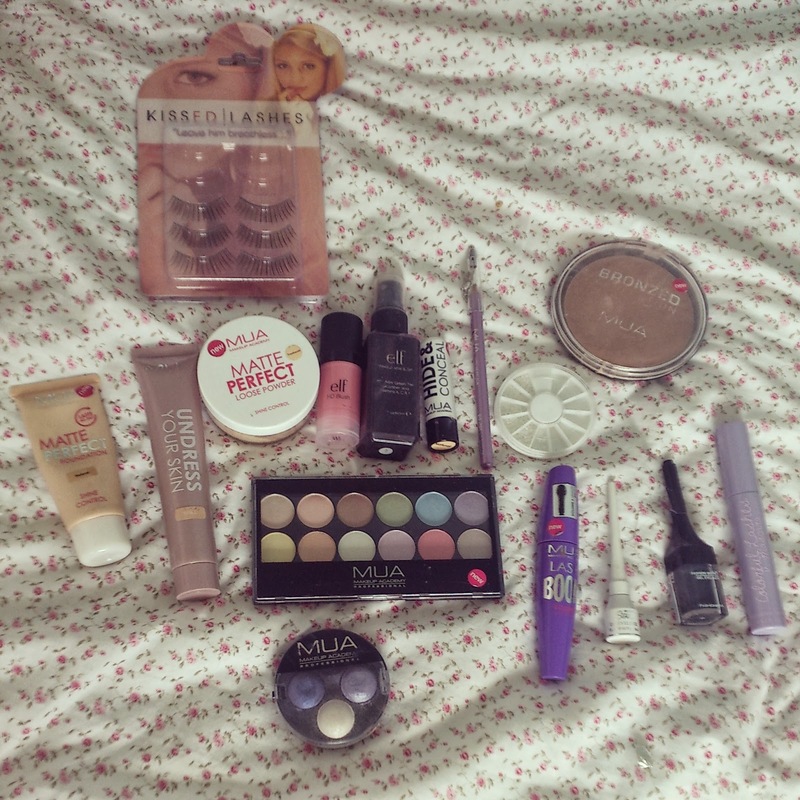 - but you can use your favourite blusher! Just apply all over the apples of your cheeks for a warm, rosy glow! 12. 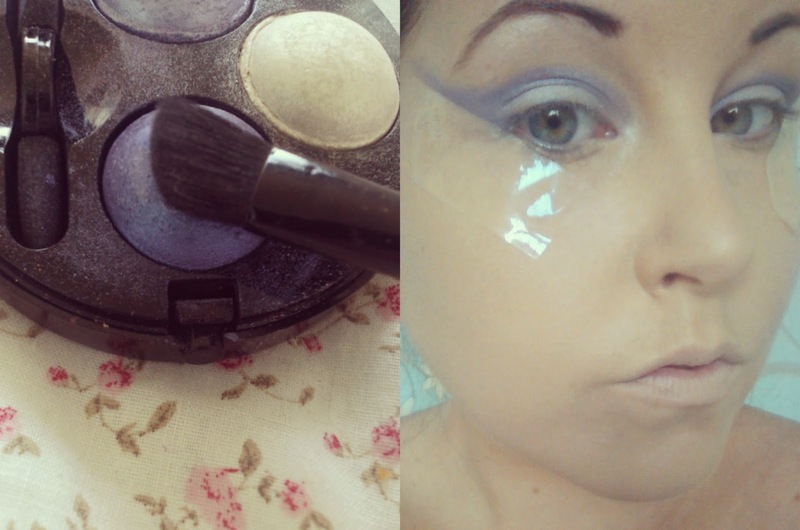 I used my MUA Eyeliner in 'Lovely Lilac' to fill in my lips & added some dots of this white liquid liner which I got from eBay to make it more fun and creative! 13. *I have to say that this part is optional! 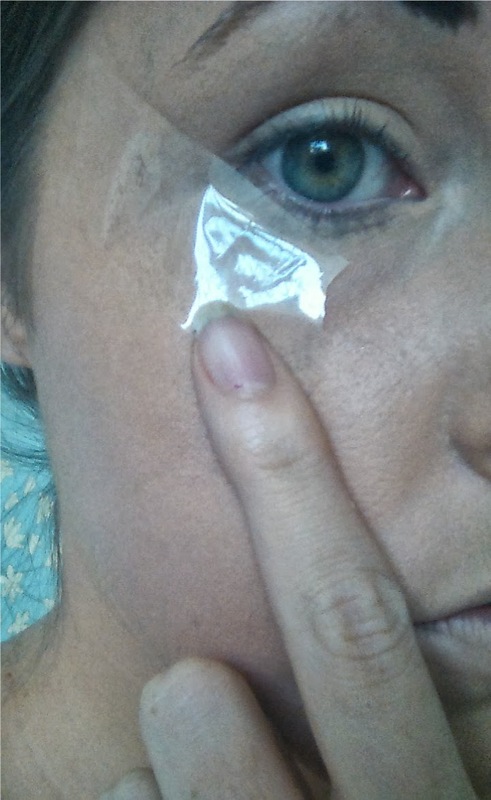 You will still look fantastic without it and not everyone is comfortable with trying out new things on their skin so if you don't fancy doing it then continue to the next step :)* I bought some sheets of silver leaf from eBay - you can apply it with eyelash glue! 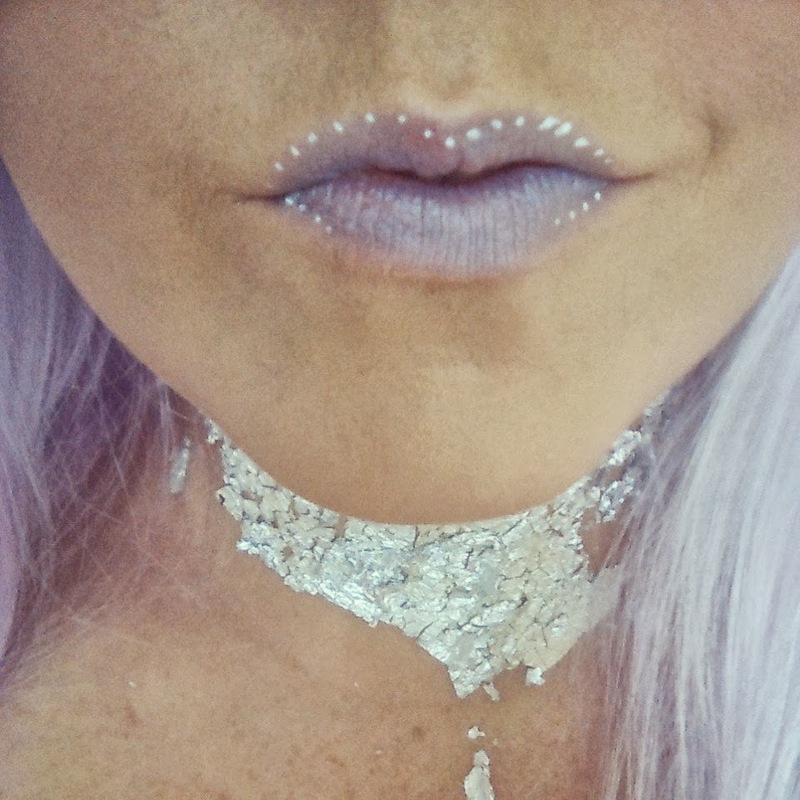 I applied a little glue to my skin and then put 3 sheets of silver leaf around my neck, I then took a stippling brush and dusted all over the sheets of silver leaf, which created this amazing crackled effect! Once you've done this just press lightly on the silver leaf with your fingers to make sure it stays in place! Finally, I Placed This beautiful Handmade floral crown by Prairie charms (see my blog post all about them in the week!) on my wig! It really finishes the look & makes it ultra girly! I am so pleased! && There you have it - You are now Enchanted! You can do so many things with this look! 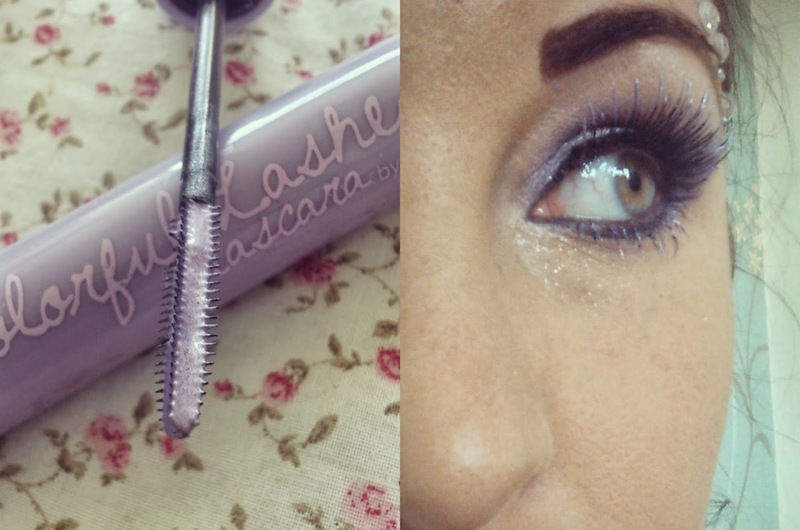 You could add more glitter, contact lenses or even more eyelashes! I hope you have enjoyed this pictorial & be sure to let me see how your final look turns out!! Also pop on over to my Facebook page (here) to get involved and help me decide on my next Halloween costume series look! Halloween is, Other Than Christmas, My favourite holiday - it is a chance to get creative, Be Scary & have fun being someone (or something!) else for just one night! Like me, some of you will love getting as gruesome and as horrific as possible with your costume, but there are others who may like to tone it down & dress as one of their favourite characters or celebrity - all costumes are brilliant and as long as you have fun dressing up - then go for whatever you like! Here are some costume ideas I've practiced over the last few years! So, Over the coming weeks leading up to the spookiest night of the year - I am aiming to bring you some costume ideas - from Disney characters to horror movie monsters! If you have any ideas or anything you want to see me try - please write in the comment box below or visit my Facebook page (here) to get involved! I am going to keep the make-up looks simple and informative so that all makeup abilities can try them or be inspired to do one step further! 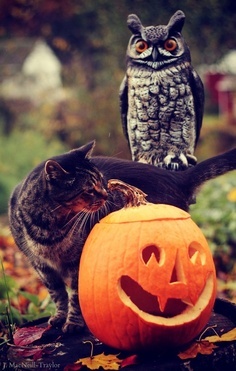 I will also be bringing you ideas of tricks and treats that you can do yourself this Halloween! Friday 11th October - MY READERS DECIDE!!! Friday 25th October - MY READERS DECIDE!!! Only 1 week Until the Fun begins so get your Make Up Ready and your channel your inner zombieee! 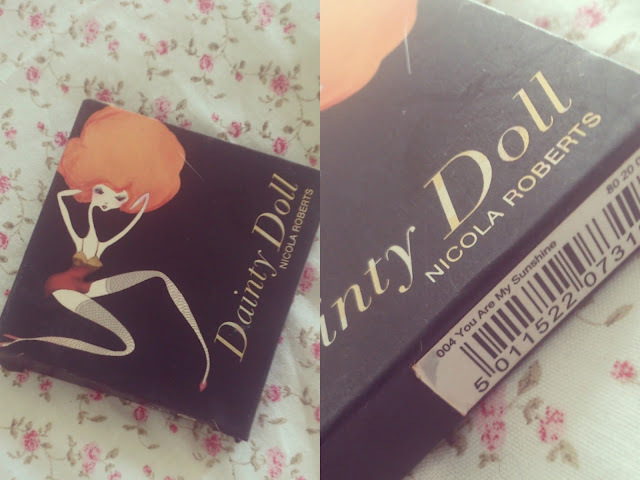 I was browsing at the local market recently when I Spotted A pretty Blusher from the 'Dainty Doll' range designed by Nicola Roberts of Girls Aloud. I had always wanted a product from this range when they sold it in boots but never got round to buying anything, so I was very pleased when I got my hand on this! I Love the packaging so much! It is so Girly yet professional looking! I picked up the Blusher in shade 004 'You are my sunshine' for £2! The black theme continues throughout the compact and it has a lovely mirror inside - the perfect size to apply on the go! 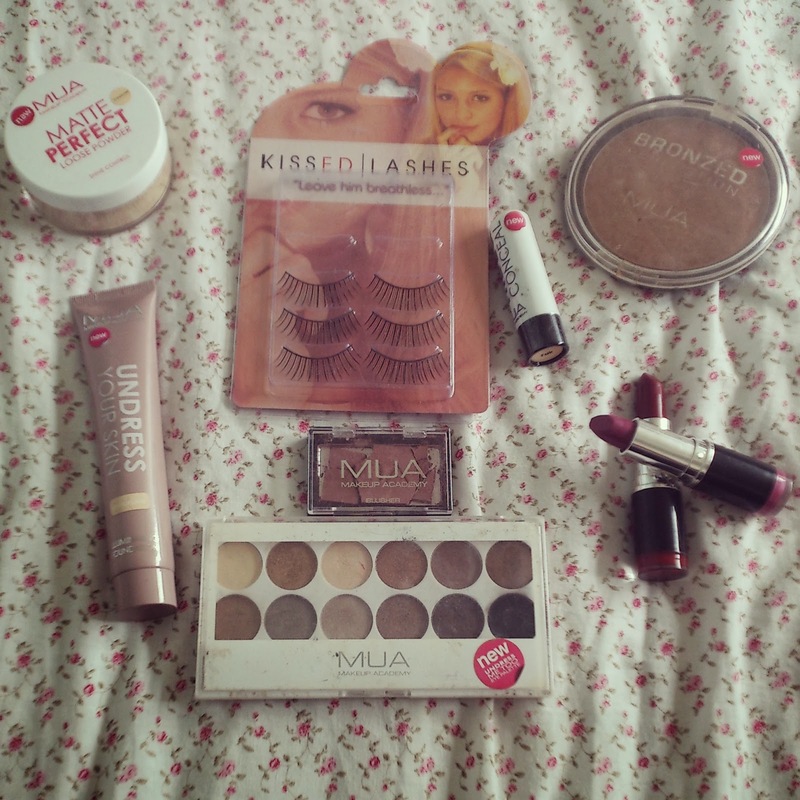 The only thing I wished for was that the shade name and number would be on the compact aswell as the box! The Blush itself is just gorgeous. 'You are my Sunshine' is a wonderful peachy colour with a golden glow! 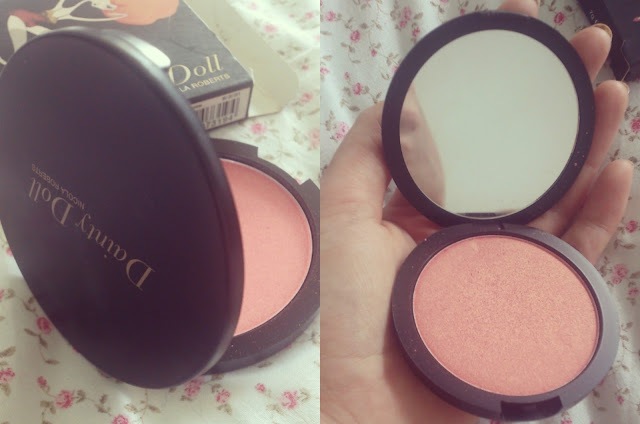 The product applies smoothly when sweeped on the apples of my cheeks and lasts all day - I've found that this is a tough little blusher too, I dropped it and it did not smash up atall! 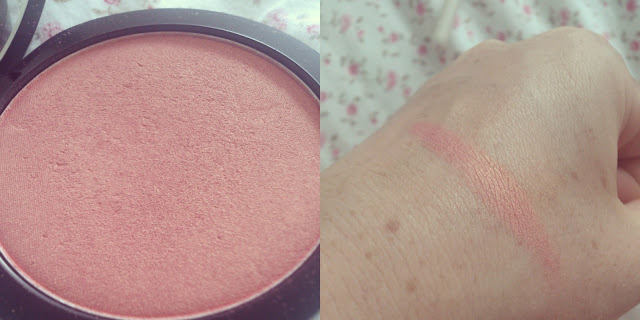 I love the way the blusher makes my cheeks look all peachy and the way it reflects in the sunshine - this color looks so lovely on fair skin and tanned skin alike, it is subtle but still give you a lovely glow! What is your favourite celebrity cosmetic Line?